Lord Vishnu said, “My dear Lakshmi, you have heard from Me the glories of the First Chapter of Bhagavad-gita Now please listen carefully, as I tell you the glories of the Second Chapter. Once in the South in the town of Pandharpur, a very learned brahmana by the name of Devashyama lived. He was able to perform all kinds of fire sacrifices. He also knew the importance of receiving guest. And by his activities he managed to satisfy all the demigods. But he was not happy and peaceful in his heart and mind. 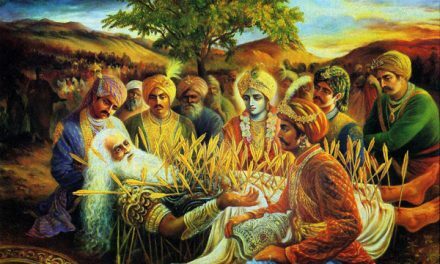 He had the desire to attain knowledge of the soul’s relationship with the Supersoul, Paramatma, and towards this end he would invite many yogis and tapasvis, and render all kinds of service to them and inquire from them about the Absolute Truth. In this way he passed many years of his life. That tiger said, “My dear goat, since I have come to this place, all anger has left me, and I have no hunger or thirst”. The goat said, “I also do not know why I am feeling so fearless and peaceful. What can be the reason for this? If you know, then kindly inform me”. The tiger replied, “I also do not know. Let us inquire from that person” When I saw this change take place in the activities of that tiger and goat, I become very much astonished. At that time they both approached me, and inquired as to the reason. I noticed that a monkey was sitting on the branch of a nearby tree. I went along with the two of them and inquired from that monkey-king. That monkey replied to our question with great respect. “Listen, I will tell you, it is a very old story. In that forest, just in front of you, there is a very large temple in which Lord Brahma installed a Shivalinga. Long ago, a learned sage of the name Sukama, who had performed many austerities, lived there. Daily he would bring flowers from the forest and water from the river, and worship Lord Shiva. When the sage heard the words of Sukama, which were full of submission, he became greatly pleased. 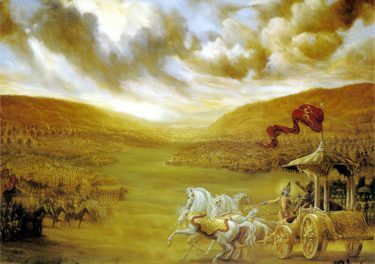 And he wrote on one piece of stone the Second Chapter Srimad Bhagavad-gita. He then instructed Sukama to daily read those verses. “By so doing, you will quickly attain your goal.” After having spoken thus, that sage disappeared from that place while Sukama was looking on. After that, following the instructions of that sage, Sukama recited those verses daily for the rest of his life. 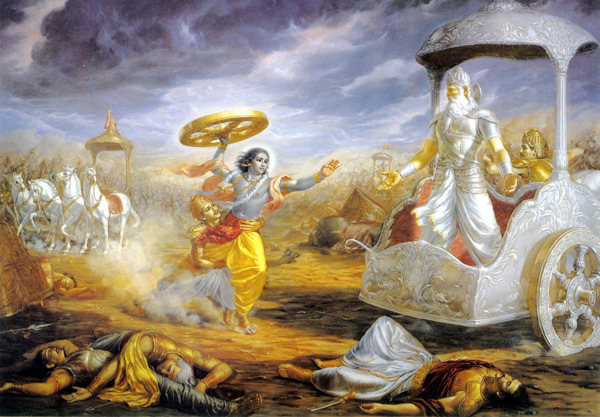 Very quickly he attained complete knowledge of Lord Krishna. And from the day he started reciting those verses, he felt no more thirst or hunger. Lord Vishnu said, “My dear Lakshmi, in this way Devashyama attained knowledge from Mitravan and after worshipping that great soul, he returned to Pandharpur and daily recited that Second Chapter. And whoever visited Pandharpur, Devashyama would first recite before him the Second Chapter of Srimad Bhagavad-gita. 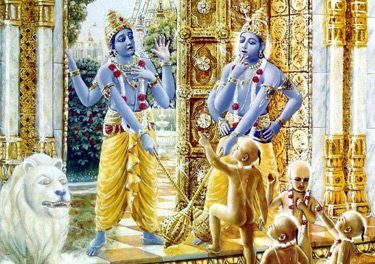 In this way Devashsyama attained the lotus feet of Lord Krishna.